For comfortable rides from newborn through toddler, the Cortina� CX has an adjustable backrest with 8 recline positions. The flat position and pop-up footrest create a cozy bassinet for infants with enclosure on all four sides. The innovative Memory Recline function retains the backrest position during folding/unfolding, eliminating the need to readjust between trips. Front-wheel suspension and optional toe-tap swivels make it easy to maintain a smooth ride from surface to surface. An adjustable canopy with peek-a-boo window offers shade from the sun. The Cortina� CX folds compactly with one hand and stands on its own when folded. The child tray has two cup holders, a removable dishwasher-safe liner, and opens from either side or detaches completely for easier in/out. The parent tray includes a cup holder and covered storage for smaller items, and the basket provides space for larger items. An ergonomic, padded push-handle has three height adjustments to comfortably accommodate Mom or Dad. Toe-tap brakes keep the stroller in place when parked. 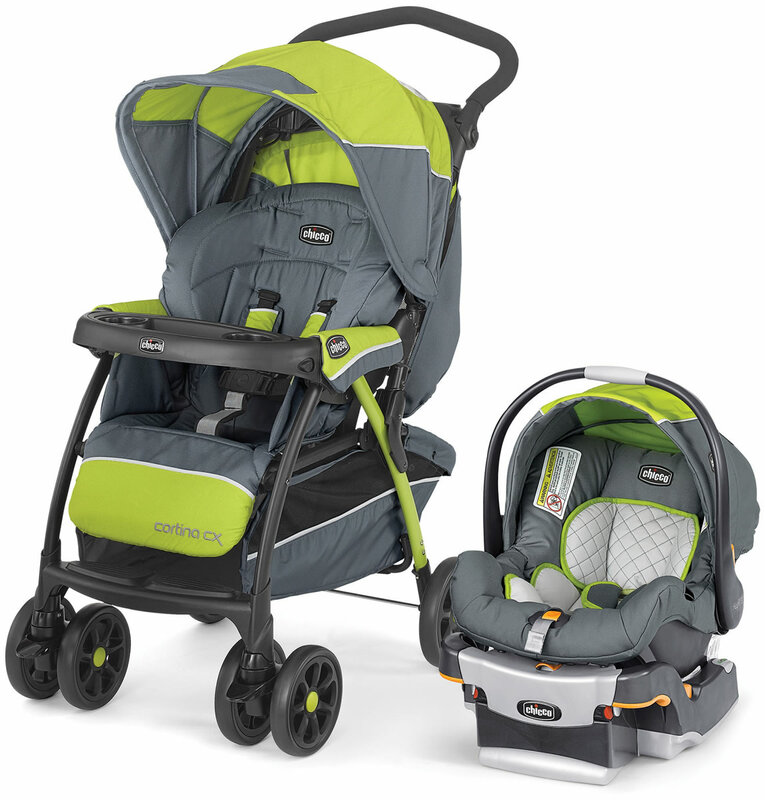 For use as a travel system, the Cortina� CX Stroller accommodates all KeyFit� infant car seats with easy click-in attachment. The Cortina� CX in Iron combines jet black and charcoal grey for a clear stepping-out statement. ReclineSure� spring-loaded leveling foot adjusts to fit the angle of your vehicle seat. RideRight� bubble level-indicators on each side of the base show when the proper base angle has been achieved. Then, to secure the base, SuperCinch� one-pull LATCH Tightener uses force-multiplying technology to achieve a tight and secure fit! Lined with energy-absorbing foam, the KeyFit 30� is equipped with a five-point harness that can quickly and easily be adjusted for an accurate fit, using the one-pull harness adjustment, and an ergonomic infant insert provides extra support for smaller babies (4�11 lbs) on their first trips in the car. 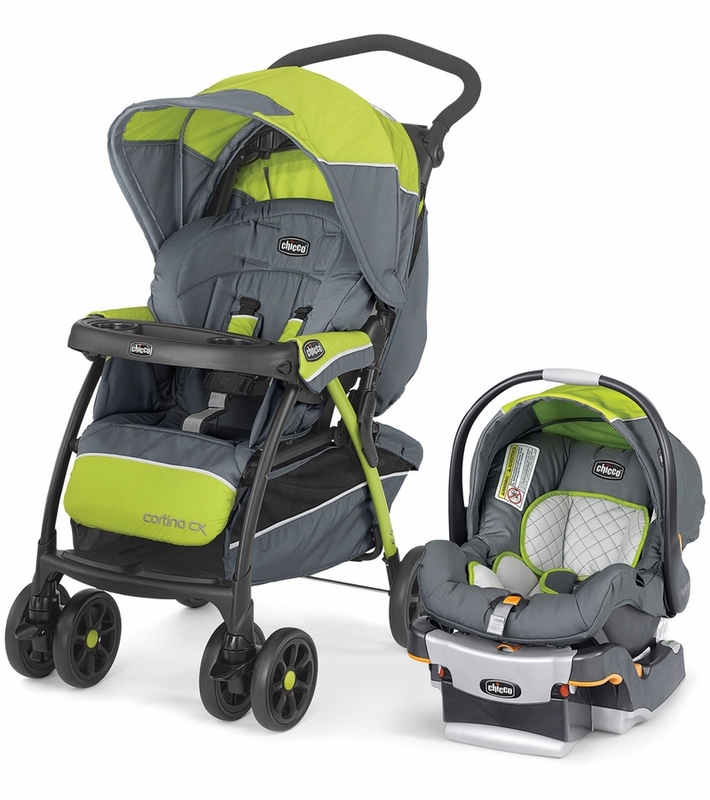 Open Dimensions: 34.25 x 20.75 x 44"
Folded Dimensions: 42 x 21 x 20"
KeyFit� 30 Infant Car Seat: Babies from 4�30 lbs. My child is 11 months now and I have used this travel system since she was born. I love the car seat and stroller! The seat easily pops in and out of the stroller. The stroller is nice to use on it's own also. Very please with this purchase! Rugged Quality, it will come for years Sure! Key Fit 30 is No1 Car Seat as all you know. Only Difference is Stroller when you choose between Cortina CX vs Bravo System. Cortina CX has Infant Bassinet and Recliner with all the way down Support. If you would like to use the Stroller from Day 1 of baby born then Cortina CX would be best Choice with the infant Support. Great stroller and car seat combo! We bought this for our first son 3 years ago, and it was amazing then, and it's continued to last with our second baby who is now 2 months old! Love how easy it is to snap the car seat into the stroller and how well it transitions with the child when they grow. So glad that we purchased it! We purchased the travel system before our baby was born and we have used it for almost 6 months. The car seat fits the stroller very nicely and it is very easy to use. Baby hasn�€™t arrived yet so we haven�€™t officially used it but we put it together and it seems awesome, we are really looking forward to using it. Have been using it since day one. A little tough to put together, but haven�€™t had any problems since. Was a gift for my niece and she loved it. Great car seat and stroller. Only thing I wish was that the stroller was easier to fold up. Handle adjustment great; doesn't fit baby!! Shortly after outgrowing the infant car seat around 7 months, baby girl outgrew the stroller. At first I thought she just wanted to sit straight upright (which the stroller doesn't accommodate). Eventually I realized it's because her shoulders are wider than the infant head protecting sides (which is where her shoulders are currently). The back of this stroller measures 9" wide. She's 10" wide (now at 12 months). She's 22#, not approaching the limit or anything. UGH. She's not walking yet, and she's only going to get bigger, so I have to buy a new stroller?! I like this stroller otherwise. I'm 4'11", and it's the only one I've found which has a handlebar the appropriate height for me. Hubby is 5'9" and he puts the handlebar two positions higher and that works well for him. It's definitely not one-hand-fold, at least at my height, and it totally stymied TSA (and they get a lot of strollers...). The reason is that the handle must be turned a FULL 90 degrees, straight up, BEFORE trying to open/close it. It was annoying to have to constantly be unsnapping and resnapping that little flap in the seat when we were going back and forth between using the system together and stroller alone (~4-7 months). Actually, snapping the seat into the stroller was irksome regardless--you have to get it at precisely the right angle to get it to click. But those are minor inconveniences. What's truly wrong is the stroller's seat back width. I never imagined my baby would outgrow her stroller. She never used the full-recline feature, in fact we have not used the "8 positions" at all--just fully open for the car seat, and as upright as it will go (which is still reclined unfortunately). She never took naps in the stroller alone so we never needed those darn head-protection-side-braces. They only serve to make her uncomfortable as a toddler. Shortly after outgrowing the infant car seat around 7 months, baby girl outgrew the stroller. At first I thought she just wanted to sit straight upright (which the stroller doesn't accommodate). Eventually I realized it's because her shoulders are wider than the infant head protecting sides (which is where her shoulders are currently). The back of this stroller measures 9" wide. She's 10" wide (now at 12 months). She's 22#, not approaching the limit or anything. UGH. She's not walking yet, and she's only going to get bigger, so I have to buy a new stroller? !I like this stroller otherwise. I'm 4'11", and it's the only one I've found which has a handlebar the appropriate height for me. Hubby is 5'9" and he puts the handlebar two positions higher and that works well for him. It's definitely not one-hand-fold, at least at my height, and it totally stymied TSA (and they get a lot of strollers...). The reason is that the handle must be turned a FULL 90 degrees, straight up, BEFORE trying to open/close it. It was annoying to have to constantly be unsnapping and resnapping that little flap in the seat when we were going back and forth between using the system together and stroller alone (~4-7 months). Actually, snapping the seat into the stroller was irksome regardless--you have to get it at precisely the right angle to get it to click. But those are minor inconveniences. What's truly wrong is the stroller's seat back width. I never imagined my baby would outgrow her stroller. She never used the full-recline feature, in fact we have not used the "8 positions" at all--just fully open for the car seat, and as upright as it will go (which is still reclined unfortunately). She never took naps in the stroller alone so we never needed those darn head-protection-side-braces. They only serve to make her uncomfortable as a toddler. I knew when my son came I was gonna want the Keyfit 30 car seat. So when I found the whole system I was ecstatic! Once it arrived I fell in love and knew I made the right choice. I was able to put the stroller together and get the base in my car by myself at 8 months pregnant. I love the color and the quality of the material. The only issue I had with it was when you use the car seat to attach to the stroller you can barely access the bottom storage basket. Helped save my baby's life!! My 9 month old daughter & I were involved in a 5 car accident today which sandwiched our car hard. It was totaled so bad that it took 2 tow trucks to remove the Jeep that was wedged under our bumper. By God's grace, we were both okay. I have a couple bruises and Jenny cried from the abruptness for 20 seconds but was immediately in a playful mood once I took her out of the car. This system has an awesome design, versatility, convenience, and SAFE!! I just got this for our son due in December and it was super easy to put together considering I am not one for reading directions. I took everything apart, washed it all and found it very easy to put everything on again. I had no issues with the car seat attaching to the stroller and as pregnant as I am, I find it to be lighter than most other car seats combos. Yes it is big but with this I feel as though I'm getting my money's worth. I love how when the car seat is set in the stroller and both canopies are closed that it covers the baby up so well that it looks like armor protecting him from people's hands and the elements. I bought this for my sister who is due in the fall. I put it all together and being the mother of 5, I have owned many strollers, this is by far a favorite. The basket area is huge!! I am tempted to order another on for my 2 year old. I got this for a baby shower gift. My boy is 3 months old now. We Love this system! Easy to use and clean. The only part I don't like is that the stroller is heavy, but that's to be expected with a metal stroller. Overall a great system! Overall is assembled well. Everything was there and it feels like a good stroller and really good car seat. We are happy with the purchase. We're very happy with our purchase. We had looked everywhere for this particular color and style. This was by far the cheapest with the 20% off coupon. We highly recommend buying from here. Great service and great products! We bought a Cortina stroller with our eldest daughter, 7 years ago. We still use it for our son today! Chicco sells the replacement pads, so all I did was give the frame a facelift :) We've taken this thing to the beach, through the forest (on easy walking trails, of course), through Disneyland, and for every day to day activities. I've used it for all three of my children and it's been wonderful and sturdy. It lays back fully, which was great for my eldest in particular because she could not sleep if it was only a slight recline. I love this stroller. I will say that it's a little on the big side for storing, but it's not hard to collapse. I would recommend this stroller based on how long we've had it, and how well it's held up. Great product. Very highly rated. Looks terrific. I'm not sure if mine is defective, but the sun shade on the car seat won't stay forward, I'm constantly pulling it up to keep him shaded and then it just slides back again . A little disappointed. I bought this travel system as a second stroller to travel with due to price and rating of car seat. However, the stroller is big, bulky and heavy. The maneuverability is poor. I have used it maybe 5 times and the wheels sound/feel like they are going to fall off. I would not recommend this stroller. I bought this stroller weeks ago and i love how easy it is to open and close. It is a lil heavy and bulky but the handling of it such as features of the handle makes it easy. I don't like how i do struggle to get carseat to click on stroller because of the overlapping material but im figuring it out. Hopefully its not as hard and i read directions wrong. Overall great stroller. First time mom by the way so hopefully it last long time. I bought this stroller weeks ago and i love how easy it is to open and close. It is a lil heavy and bulky but the handling of it such as features of the handle makes it easy. I dont like how i do struggle to get carseat to click on stroller because of the overlapping material but im figuring it out. Hopefully its not as hard and i read directions wrong. Overall great stroller. First time mom by the way so hopefully it last long time. Bought this for my newborn and it is perfect. Well thought out and ergonomic.